At least half of all neuropsychological assessments are performed on elderly persons, but the information clinicians need to make appropriate judgment calls is widely scattered. Several books offering general descriptions of the cognitive functioning of the aged or of neuropsychological conditions affecting them are helpful to practitioners but do not provide reliable and valid normative information. Two books that do provide this information do not focus on geriatric populations. A concise, yet comprehensive summary of what we now know about those over 65--with an extensive bibliography--An Assessment Guide to Geriatric Neuropsychology fills the gap. The neuropsychological assessment of elderly persons involves not only the performance-based measurement of various capacities but heavy reliance on reports from caregivers (both formal and informal) about the day to day functioning of the affected person. It also raises important, yet often neglected, ethical concerns. The authors discuss all the measures that detect and discriminate among cognitive disorders of elderly persons, including special measures relevant to caregiver reports, and provide useful tables to assist in differential diagnosis. They also reflect on the ethical issues that often confront the assessor of an elderly individual: informed consent, confidentiality, the right of bodily autonomy and self-determination, and appropriate feedback. This book will be an invaluable resource for all those called on to evaluate older clients. "An Assessment Guide to Geriatric Neuropsychology is going to be a valuable resource for clinicians and researchers working with adults over the age of 65. In many respects the book is similar to Lezak's classic Neuropsychological Assessment and to Spreen and Strauss' Compendium of Neuropsychological Tests, but is restricted to older adults. 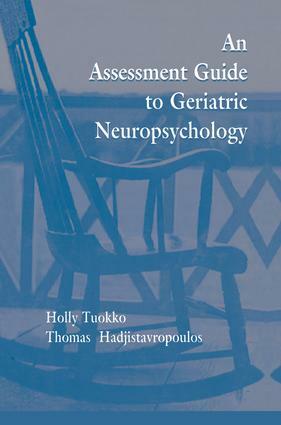 It contains a very comprehensive description of the major neuropsychological instruments available for geriatric assessment, along with detailed norms for elderly adults when they are available. Most of this information is not readily available in other sources, and thus the book will likely be widely used, and appreciated, by those who work with elderly populations." Contents: Preface. Issues in Psychogeriatric Assessment. Psychometric Issues. Screening Instruments for Cognitive Impairment. The Wechsler Adult Intelligence Scales. Measures of Intellectual Functioning and Neuropsychological Batteries. Memory Assessment. Attention and Executive Functioning. Language, Visuospatial, Perceptual, and Motor Functioning. Assessing Psychopathology. Age-Associated Conditions Affecting Cognition. The Role of the Caregiver in Neuropsychological Assessment. Ethics in the Assessment of Elderly Persons.